Many thanks to our wonderful volunteers who potted on numerous plants and took charge of organising a really fantastic plant and wildlife activity stall at Bungo in the Back Lanes raising over £150 for The Hidden Gardens. Allan Hughes, one of our dedicated gardening volunteers, wrote a piece of prose inspired by seasonal beauty of The Hidden Gardens. A winter mist silently shrouds the Hidden Gardens. The still white cloud quietly cloaks the sleeping settlement. The air is cold, fresh and moist. High up, a crow’s caw cuts into the sky as the diffuse glow of morning light begins to permeate the slowly rising haze. The shimmering shadow of a returning fox briefly disrupts the calm; then fades. The quiet returns. As dawn gradually breaks, groups of nestling bushes and shrubs awaken with the rustling of rousing wildlife. Trees stretch with a concertina of balletic branches praising the arrival of the new day. The clinging mist finally releases and ascends, leaving a glistening layer of silvery white frost settling on the emerging pasture. The delicate blades of grass sparkle in the morning light. At the far corner of the extending lawn, the solitary figure of a Ginko tree stands tall and proud like a wise tribal elder. Its branches spiral upwards to the heavens. The surrounding congregation bows reverently in anticipation of the winter solstice. Then, all is hushed. A single track of tiny prints zips through the crisp, white frost. All focus on the track as it makes its way towards the bottom corner of the lawn. Towards the Ginkgo Tree. The footprints come to a halt. A little Robin Red Breast stands boldly on the cold, glittery grass, arching its head, to address the rising giant. A loud silence fills the air. The little Robin hops closer, perching on the tree’s knobbly roots. Its tiny beak chirps……the silence gets louder……the Ginko considers the wee postulating creature……the silence intensifies…..then…at last, all is well…harmony prevails as the Robin Red Breast takes off, spiralling upwards, playfully twirling in and around the giants welcoming branches. All is bright. dense foliage. On entering the grounds, the snowflake gravitates towards the long strip of land. Downwards it falls, steadily descending, prepares to land, then settles safely on the glistening grass. and more frozen flakes are boisterously launched into the air in a sustained onslaught. Myriads of sparkling fragments hurriedly jostle for space, propelling bursts of snow into every nook and cranny. No corner is spared. Then, when the biting gusts of wind, at last, relent, the hail slows up, until, eventually, the invasion finally ceases. The quiet returns. The Robin peeps out from its shelter. All is clear. The landing is complete. The slumbering garden is now thickly blanketed by soft, pure, white snow. All is calm. A full moon illuminates the newly colonised terrain. The lunar light diffuses a cool, serene glow over the opulent gardens. The undulating snow softly cloaks the clusters of huddling bushes. Branches bend with lilting leaves. The undergrowth is hidden out of sight. As the last snowdrop falls to earth, the tranquil evening moonlight blesses the winters night. The long, untouched lawn elegantly emerges evenly covered, edge to edge, with a thick coating of soft, fresh, snow. Up above in the clear night sky, the Ginkgo tree is eloquently silhouetted by an aurora of celestial light, as a constellation of stars twinkle brightly in celebration of the solar resurrection. It’s the longest night. The long silent night encloses in on the world. The Earth is at rest. The garden is sound asleep. The evening is still, quiet, at peace. Reaching upward, the Ginkgo tree embraces The Heavens. The surrounding ensemble bows as the ethereal cycle unfolds. The tree’s outstretching branches herald the Transformation of Time. It is a time of change. Seasons change. Dark gives to light. Night to day. What was dormant, will now grow. As the night passes and eventually draws to a close, the passage of Time will bequest its gift to Creation. The hidden world will awaken to the unveiling of the divine light of dawn, radiating with the essence of the suns’ warming presence, that shall transfigure a new beginning, a new day, a new life. There are lots of artistic ways to interpret the Gardens, such as through drawing, poetry or photography. Prose is a little rarer, but this story by Roots and Shoots volunteer Allan shows that it’s a great way to describe the feeling of The Hidden Gardens. After journeying through endless blocks of busy buildings, I descend metal stairs into a narrow dark corner. A green door stands, waiting. I enter. Opening into the stillness of a fresh morning, the white sky expands exponentially around the tranquil scenery, revealing a secluded world waiting to be discovered. A tall tree stands proud on its pristine lawn. The neat lawn stretches like a green velvet carpet. The surrounding foliage encircles the scene in an organic arena. The busy blocks fade into a distant memory as I wander further into the wild. A path invites me to explore. The rhythmic crunching of my footsteps on pebbles accents the serene quiet. Meandering along the path, the wilderness begins to reveal itself. A sudden fluttering resonates in the undergrowth as I enter the private sanctuary. Birds twitter and whistle cheerfully up amongst outstretching branches, while a passing seagull jabs high-pitch staccato into the hidden harmony. I notice some rustling amongst the blanket of crackling leaves. I slowly approach. I follow the sound and peer through the bushes. A blackbird stands still, watching. I move closer. His gentle eyes look at me without fear, allowing me into his hidden world. Hidden Gardens volunteers braved the weather to meet at Queen’s park to take part in an OPAL Air Quality survey. This survey uses biological indicators; species whose presence is sensitive to changes in environmental conditions. Guided by Joanne Dempster from OPAL, we focused on looking at lichens with different sensitivities to nitrogen containing air pollutants and were amazed at how proficient we became in spotting different lichens in a short morning session. Our records will be uploaded to the national survey and will provide valuable information about levels of nitrogen containing air pollutants throughout the UK. Not only are lichen good indicators of air quality, but they look pretty too! 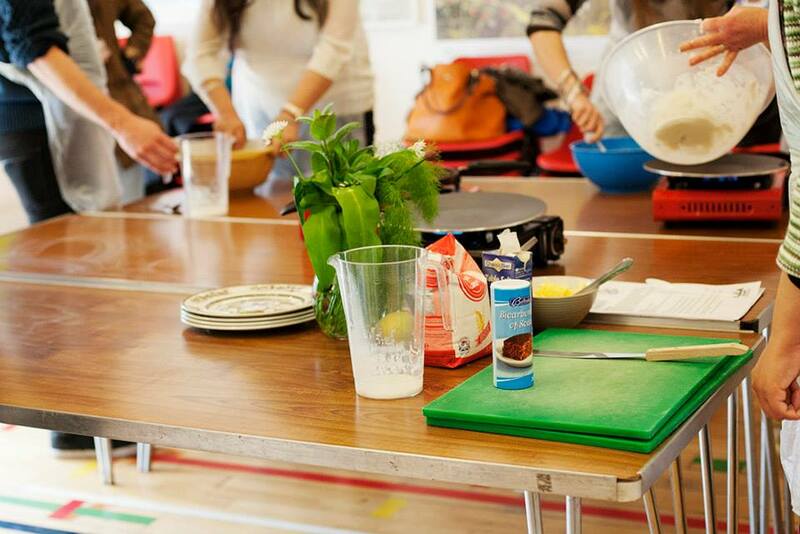 We’re running Flatbread Making Workshops in the Boilerhouse with our fantastic Cultural Cookery facilitator, Fatima Uygun, over the next few Saturdays.